The popular festivals of the Baltic Republics, which are held in Tallinn, Riga and Vilnius, pay homage to religious or historical situations. Natural cycles such as solstices and equinoxes are also of special importance. The folk tradition of Latvia has been recognised by UNESCO as part of the Intangible Cultural Heritage of Humanity. Religious holidays are usually marked by the Catholic calendar, but we cannot forget that there is a large percentage of Orthodox citizens who celebrate their events on other dates. It takes place in Estonia, every 2nd February. On that day in 1920 the country signed a treaty with the USSR, which set the border limits and recognised the independence of Estonia. This is on 14th March and it celebrates the language itself, its literature and its poetry. In June, the longest night of the year is celebrated and people go out to make bonfires and sing while they dance around. At nightfall, citizens should go to find the mystical fern flower, which will bring them prosperity and good luck. This is one of the most beautiful popular festivals of the Baltic Republics. 15th May is the day in which the city received the state, in 1248. The festival takes place in the main square of Tallinn and processions are held with a very medieval atmosphere, as well as concerts. The museums open and offer free visits. 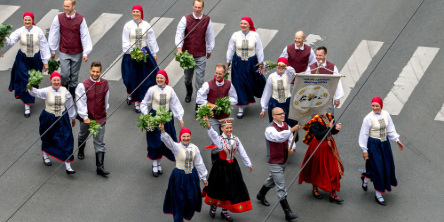 It is celebrated in Tallinn at the end of May and is a party which lasts a whole week. In its streets, you can enjoy concerts, theatre and games. June 14 commemorates the memory of the commander-in-chief of the armed forces Johan Laidoner and the presiding candidate Konstantin Päts who were deported to the USSR in World War II. This is one of the most peculiar events in Baltic Republics. It refers to an ancient tradition in which fires were set to indicate the way to fishermen. A kind of camp is prepared where typical food is made and a sailing regatta is held. Christmas in Latvia has special importance. It starts on 24th December and lasts 12 days. Thousands of candles are lit, lamps are hung in the windows and everything is filled with garlands. The decoration is especially beautiful and traditional sweets are sold. This is an appointment to enjoy a few days of Latvian music. It takes place at the beginning of February. I could not miss this celebration which is so important for the population of the country. 4th May marks the anniversary of the independence of Latvia which was won in 1991. This is one of the popular festivals of the Baltic Republics which best reflects the ancient folklore of this country. It is celebrated at the summer solstice, outdoors. Fires are lit and people sing, drink beer and eat the typical dishes of that date. The women put pretty crowns on their heads made with oak leaves. Live music is also played. Another must-see festival which is celebrated only every 5 years and during which you can enjoy the best folk music of Latvia. It takes place in Riga, in its ethnographic museum and is an event which delights tourists who are interested in the history and art of the country. It is another of the popular festivals of the Baltic Republics which is preferred by travellers. This is one of the most appreciated events in the Baltic Republics in Lithuania. It is celebrated in Vilnius, on 4th March, which is the day of St. Casimir, the patron of Lithuania. That day there is a craft festival, with street markets where all kinds of local products are sold, such as toys, clothing, footwear, paintings, decorative items, everything artisan and handmade. From 18th to 20th May, it is another important and solemn festival in the country. It is celebrated in the town of Kaunas. The mayors of the twin cities and heads of state also attend. At the beginning of July a great folklore festival takes place in Vilnius. Three days of traditional music in which the streets of the capital are filled with rhythm and joy. Like the other countries of the Baltic Republics, the day in which Lithuania's independence was restored is celebrated. In this case it is 11th March.